There’s a man at my local Saturday market that sells blueberries. He’s only there a few weeks out of the year, and when he is, he sells one thing and one thing only: blueberries. His arrival is cause for celebration. How can you not get excited about the blueberry man? Really all I want to do is drop an obscene amount of money and buy enough blueberries to fill up my entire freezer. That way I could eat doses of summer all winter long. But the freezer is small and my blueberry budget is not extravagant, so I satisfy myself with one container of plump, blue berries. Half of them are gone by the time I make it home. Such is life. At least I ensure that there’s a cup or two left so that I can make a batch of these muffins, little treats full of almond and flaxseeds, which makes them flourless and means that you can eat them for breakfast and feel good about it. It’s worth mentioning that the honey in this recipe comes from the honey man at the same market, and the eggs come from my favorite egg lady. There’s something about buying your products directly from the source that feels luxurious and so basic all at the same time. 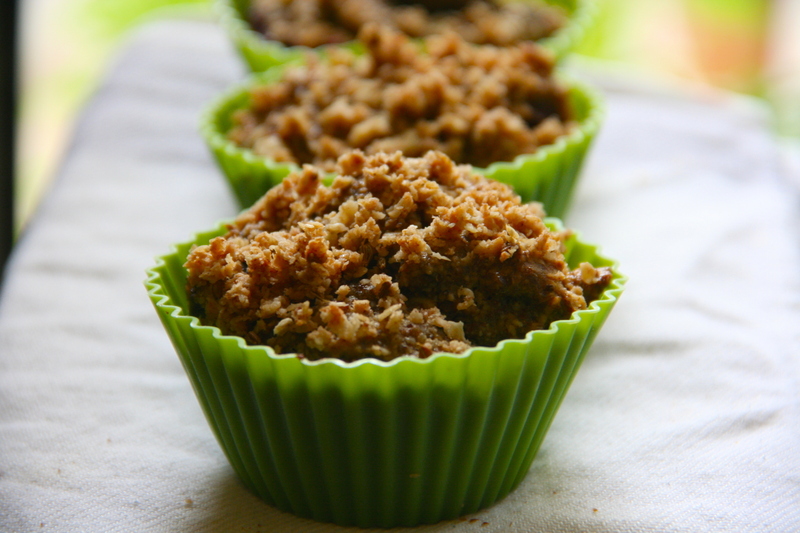 I like to make an oat topping for them as well, as it gives the muffins a little extra flair. But if you’re making muffins in a hurry, you can feel free to skip this part. Grind the flaxseeds and almonds until finely ground. Add them to a bowl with the baking powder, salt and spices. In a separate bowl, whisk the eggs, add in olive oil and honey. Add to the almond and flaxseed mixture and mix together. Add in the blueberries. To make the topping mix together the dry ingredients. Add in the honey and one teaspoon of olive oil. Mix with your fingertips until you get a crumbly consistency. Add the additional teaspoon of olive oil if need be. Scoop the batter into a lined muffin tin, or silicone liners. Sprinkle the topping on top. Bake 25 to 35 minutes at 350°F (175°C).